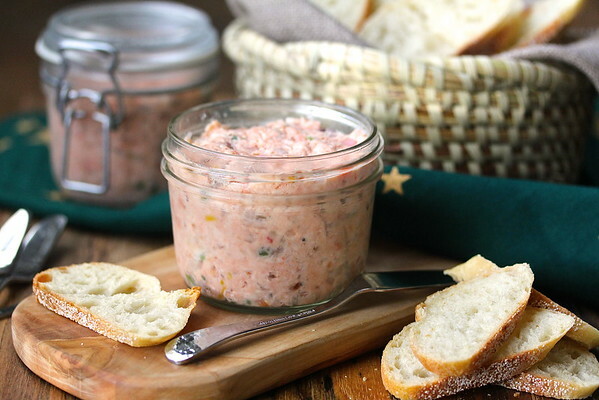 This Salmon Rillettes spread is a totally delicious mixture of poached salmon, peppery smoked salmon, a lot of spiciness, and a little butter. This is the perfect first course for the Feast of the Seven Fishes. What is the Feast of the Seven Fishes you ask? It's an Italian American Christmas Eve meal that takes the Catholic "fish on Fridays" to another level. Southern Italian immigrants brought the tradition of having a fish feast on Christmas Eve to the United States. Here it became the Feast of the Seven (at least) Fishes. You can read more about the tradition here. I think it would be so cool to recreate this feast on Christmas Eve! Along with our hosts, Heather from All Roads Lead to the Kitchen and Lora from Savoring Italy, some bloggers have gotten together to share menu ideas for your Seven Fishes feast. Along with the traditional seven fish and seafood dishes, we've included some side dishes, a palate cleanser, a dessert, and a cocktail. My contribution is the appetizer, salmon rillettes. Rillettes spread was originally a French appetizer of meat, usually pork, cooked in fat and then shredded and chilled into a spread. It can be made from meat, poultry, rabbit, or fish. In this case, the method was applied to salmon by adding butter to the mixture. The rillettes spread is usually served with bread, bruschetta, crostini, crackers, or toast points. It is definitely an elegant addition to a cocktail party, and definitely perfect for the first course of The Feast of the Seven Fishes. 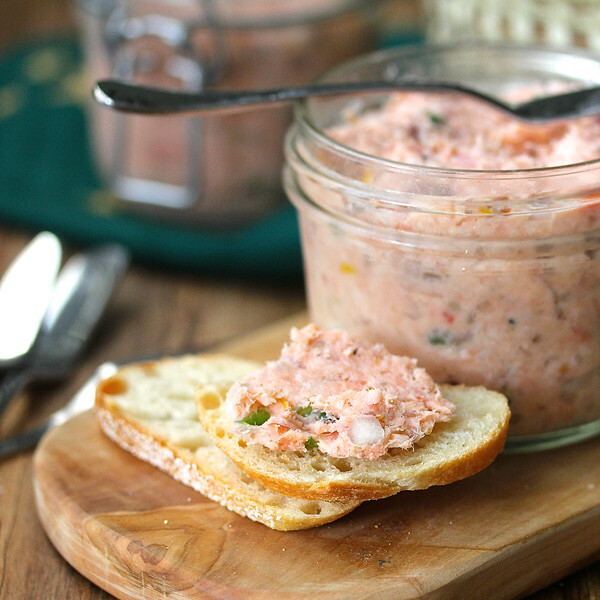 Salmon rillettes include both poached salmon and smoked salmon along with the butter. It is traditionally packed into a canning jar, but any small serving dish will do. I pretty much had this spread for breakfast, lunch, and dinner for about 3 days, and never got tired of it. This will definitely be one of my "go-to" appetizer recipes from now on. The combination of the salmons, the veggies, spices, and aromatics is amazing. So elegant with baguette slices. I poached the salmon in Italian vermouth flavored with chili peppers, bay leaf, peppercorns, coriander, and green onions. For the smoked salmon, I used black pepper coho smoked salmon. I minced a large shallot and a half of a jalpeno and added it to the mixture. So good. 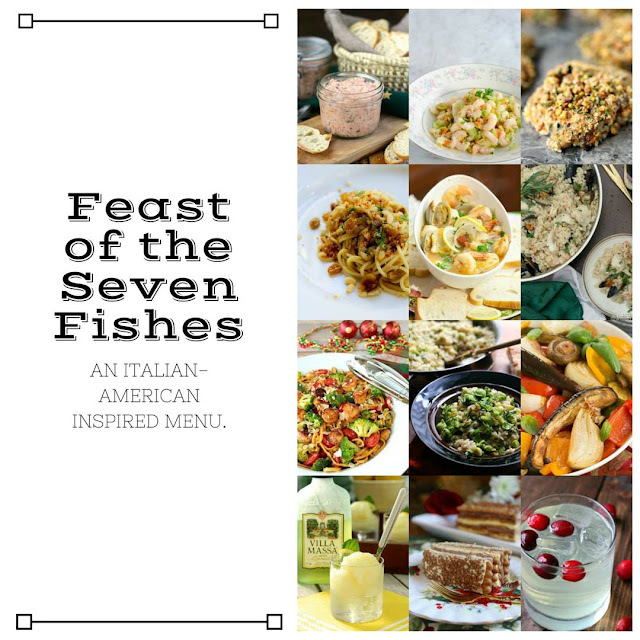 After the recipe, you'll find the rest of the recipes for an amazing Feast of the Seven Fishes. With a vegetable peeler, cut off a strip of the peel of the lemon. Finely zest the rest of the lemon and set the zest aside. Set the lemon aside. Place the unchopped half of the jalapeno into a small saucepan. Add the vermouth, water, bay leaf, peppercorns, and coriander seeds. Bring the mixture to a boil over medium heat. Add the green onions and fresh salmon cubes. Reduce the heat to low, cover, and simmer for three to five minutes. Drain in a colander. Discard the vegetables and place the salmon in a medium bowl. Mash the salmon roughly with a fork. Add the smoked salmon and mash with a fork. Add the butter and blend with a fork. Add some of the juice from the lemon, the lemon zest, along with some salt and pepper to taste. Add the shallots, minced jalapeno, crushed pink peppercorns, and crushed red pepper. Mix thoroughly. Stir in more lemon juice, to taste. Pack the mixture into a canning jar or other container. Press the top with plastic wrap and refrigerate for at least 2 hours and up to a day before serving for the first time. The rillettes will last up to 3 or 4 days. Brought to America from Southern Italy where it is all now but forgotten, the Feast of the Seven Fishes is a meal eaten by Italian-Americans that features (at least) seven fish/seafood dishes. I've made this recipe, too---Dorie hit it out of the ballpark, and so did you!! What a perfect starter for our feast! She did Liz! I actually Googled French Fridays to get feedback on this recipe! What a wonderful way to enjoy salmon as an appetizer for the Feast of the Seven Fishes. I would probably also be enjoying it any time of the day, it looks great! Buon Natale! It's really good Heather. I kind of offered it to my husband, but not with much enthusiasm because I wanted it all! Oh my gosh! This sounds amazing. What a way to start a fabulous meal. This is a lovely start to the traditional Christmas Eve meal! Looks beautiful, too! My son has been bugging me to have salmon lately! This is perfect! You will make him very happy! What a lovely treat for Christmas and I learned something new about the Feast of the Seven Fishes! I can't even imagine how flavorful this must be! All those lovely fishes along with all those lovely herbs and spices. What a perfect start for this feast! Thanks Renee! At first I thought I was over doing it with the chiles and shallots, but the balance was perfect. I totally love this recipe, the spicy and creamy makes me happy! Sally, this is one of my favorite recipes on this blog, no hyperbole, and the perfect snack. I will be making this for all of my guests for sure. If you can't find the pepper smoked salmon, add more pepper corns! Favorite recipes on the blog!!!! Ok, if THIS is not a great endorsement, I don't know what is. I have some leftover smoked salmon from a party. Now I know exactly what to do with it! This sound fantastic. 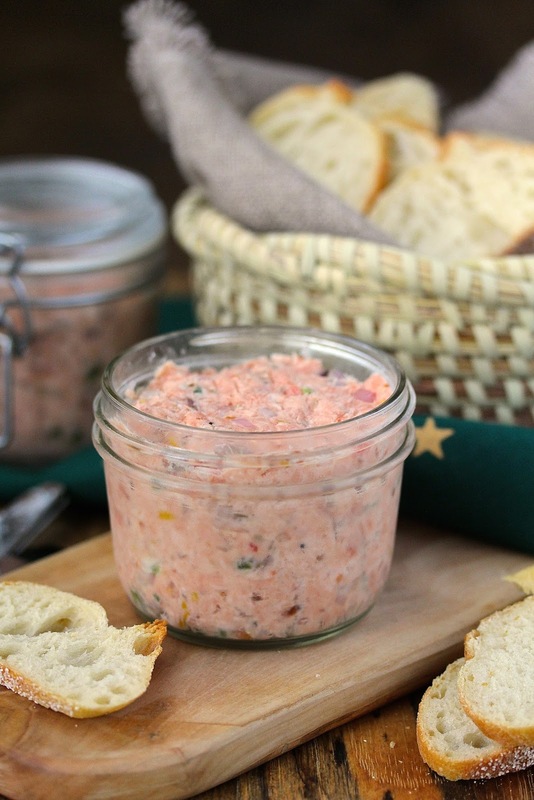 Oh, I have been looking for a tried and true salmon rillettes recipe for ages and this looks absolutely delicious! Thank you!! Perfect for our little New Year's Eve dinner! Happy and Joyous Holidays to you and yours, Karen! !